Poco begins to scale back their maniacal roadwork beginning this year. Although they are playing concerts for nearly six months straight, it is a quiet year in comparison to the band's previous history. The change from Epic to ABC Records gives the band enough financial stability to allow them some time off from the road. Poco also makes its second visit to England and Europe late in the year. July 1975 (UD) Electric Ballroom, Dallas, TX Poco was tentatively scheduled to play this venue. No confirmation on whether they actually fulfilled it. July 15 Tarrent Co. Convention Center, Ft. Worth, TX Stephen Stills Only 2,500 show up for show. 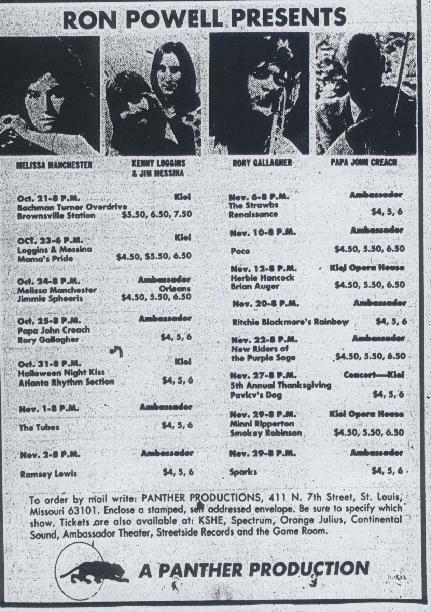 July 17 Spectrum, Philadelphia, PA BTO & Kansas Show grossed $106,000 of a possible $110,000 with 18,000 people in attendance..
July 18 Music Hall, White Plains, NY Originally booked for the Capitol Theatre in Port Chester, NY. Thanks to Corey Bearak for confirming the White Plains location. July 19 Roosevelt Stadium, Jersey City, NJ Eagles and Seals & Crofts This was a sell out with 30,000 people in the stands. The gross was a whopping $225,000. July 22 Ellis Auditorium, Memphis, TN Dave Mason This show was a sellout with a gross of $24,000. July 23 Mississippi River Festival, S. Illinois U., Edwardsville, IL Dave Mason 20,838 attend this show. 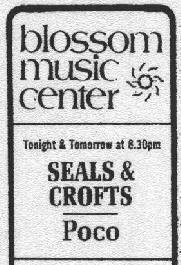 July 25 Dayton Hydroglobe Music Festival, Dayton, OH Seals & Crofts Just learned that Poco cancelled their appearance at this festival. Their equipment truck broke down in Indiana. Paul Cotton stayed with the truck while the others kept going. They arrived in time but without their equipment and their lead guitarist, they had to cancel. July 27 New England Folk Festival, Stoneham, ME Richie Havens, Seals & Crofts, others Fan recollection (Eddie G.) This was the final date of a three-day event. July 29 Baltimore Civic Center, Baltimore, MD Dave Mason, Livingston Taylor, John Wells Delegation Taylor cancelled without notice and a local bar band opened the show. July 30 Schaeffer Music Festival, Wollman Rink, Central Park, New York City, NY Kinderhook Creek A tremendous sellout for a gross of $18,000. August 1 Calderone Concert Hall, Hempstead, L.I., NY Livingston Taylor Show grosses $23,000 of a possible $29,000. An audience tape of a portion of this show exists from the live WLIR-FM broadcast. August 4 Freedom Hall, Johnson City, TN Eagles Kevin Blanton recalls seeing Poco open for the Eagles at this venue in 1975 and we have confirmed it. August 11 (?) Unknown venue, Springfield, IL America This date appears on Americas tour itinerary. It is unconfirmed if Poco joined the tour at this point or a few days later. August 13 Cumberland County Auditorium, Fayetteville, NC America Appearance confirmed by ticket stub. 4,500 attend the show for a gross of $24,000. August 14 Memorial Auditorium, Greenville, SC America 4,600 in attendance for a gross of $25,000. August 15 Carolina Coliseum, Columbia, SC America The venue for this date has been called into question by Poco fan Danny Jones who informs us he saw Poco and America at the Charlotte Coliseum, not in Columbia. August 16 Jai Alai Fronton, Miami Beach, FL America An audience tape exists of this show. I had these two Florida shows reversed in the database but just discovered that Miami happened on the 16th and Lakeland on the 17th. August 17 Civic Center, Lakeland, FL America An audience tape exists of this show. It runs fast. August 22 Schaefer Music Festival, Wollman Rink, Central Park, New York City, NY Deadly Nightshade This show was taped for the King Bisquit Flower Hour, aired later in the year. August 24 Red Rocks, Denver, CO Poco canceled this appearance. Richie Furay had intended on attending and sitting in on a tune or two, which would have been his first appearance with Poco since he left the band back in September 1973. August 28 Civic Center, Charleston, WV Eric Clapton A tape has surfaced of this show. This is often cited as taking place in South Carolina. However, West Virginia is the correct location. August 30 Scope, Norfolk, VA Eric Clapton Poco jams with Clapton on Let It Rain and is captured by a Clapton fan on tape. 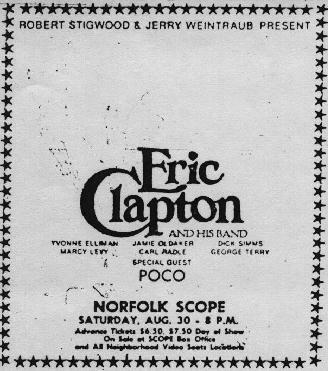 Paul Cotton is the source for the other Clapton shows, claiming Poco opened for him on the last 4 dates of Claptons tour. September 12 Santa Monica Civic Auditorium, Santa Monica, CA Batdorf & Rodney Al Garth and John Brennan guest. 2,144 attend the show for a gross of $13,141. "Poco's concert provided some of the best that country rock has to offer, but regrettable there were far too many empty seats. But Poco fans are intensely loyal and their involvement almost made up for those wide open spaces," noted Herald-Examiner reviewer Robert Kemnitz. September 13 Greek Theater, Berkeley, CA Crosby-Nash No confirmation on this show. Although listed on Pocos itinerary, they were never billed to play this show. 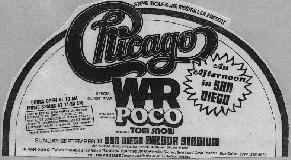 September 14 Balboa Stadium, San Diego, CA Chicago, War, Tom Snow 12,912 attend this big outdoor show for a gross of $105,164. September 21 Newcastle Odeon, Newcastle, England America Our thanks to Leslie Hughes for sharing some great photos of Poco in action! September 23 Hippodrome, Birmingham, England America An audience tape of this show exists. September 24-25 New Victoria Theater, London, England America Average audience tapes exist for each show. September 27 Pavillion De Paris, Porte De Pantin, Paris, France America A noisy audience tape exists for this show. September 29 Het Concertgebouw, Amsterdam, Holland America Jeffrey Middleton provided a correction to the venue. Jan Wessel also donated a great set of his photos from this show to the set. September 1975 (UD) Unknown venue, Mannheim, Germany America This was mentioned as a possible venue for America/Poco. October 12 Poco on King Bisquit Flower Hour airs their July 30 performance at Central Park. October 29 Memorial Auditorium, Buffalo, NY Doobie Bros. and Outlaws $74,000 gross for this performance. October 31 Madison Square Garden, New York City, NY Doobie Bros. and Outlaws $108,000 gross for this sellout performance. November 2 Laker Gym, SUNY, Oswego, NY Cross Creek Thanks to Alan Aronsen for providing this date. November 7 Hirsch Memorial Coliseum, Shreveport, LA Marshall Tucker Band From the Denny Jones archives, Show was a sellout. November 8 Assembly Center, Tulsa, OK Marshall Tucker Band, Point Blank From the Denny Jones archives. November 9 Century II Performing Arts Center, Wichita, KS Marshall Tucker Band, Point Blank From the Denny Jones archives. Show was a sellout. November 14 Capitol Theater, Passaic, NJ Tom Waits Show grosses $12,659 of a possible $21,000 as 1,958 attend the show..
November 23 Pauly Pavilion, UCLA, Los Angeles, CA Stephen Stills and Flo & Eddie 9,470 attend this show for a gross of $46,702. December 19-20 Winterland, San Francisco, CA Kingfish Poco canceled this show to appear at the New Years Eve show at the Cow Palace.